KODAK Lenses are designed, created and manufactured to the exacting standards you would expect from a trusted brand like KODAK. Within our range, you should find a KODAK Lens for everyone. High performance and great looks come together with Kodak Clean&Clear lens coating. The propriety top coat repels dirt, grime and fingerprints, making cleaning easier. Distracting reflections are also eliminated giving your eyes a clear and bright shine. Kodak Clean&Clear lens coating is tough enough to resist cracking, crazing, peeling and provides durable protection against scratches. Please click the "Check Price" button below to get the lens price based on your current prescription. 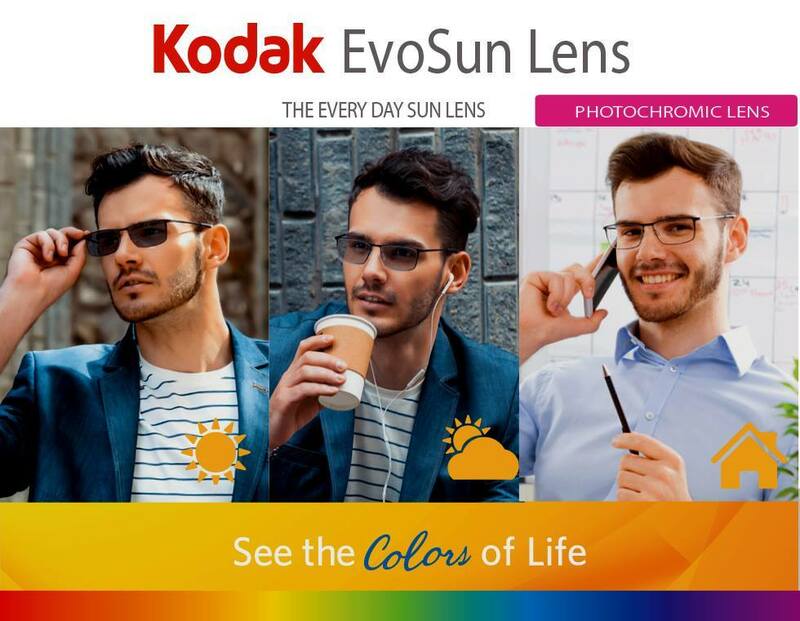 Kodak EvoSun Lens is an every day lens that quickly adapts from being naturally clear indoors to being fully dark in bright sunlight outdoors, offering a distinct advantage over other clear lens types. Ideal for all wearers, including young adults and children, Kodak UVBlue lens provides protection from damaging UV rays and harmful high-energy blue light, without altering or distorting color perception. Kodak UVBlue lens blocks harmful light wavelength up to 420nm. This is especially helpful for adults and children who spend many hours struggling to focus on mobile phones, tablets, laptops and television.